This week is National Veterinary Technician Week. The National Association of Veterinary Technicians in America (NAVTA) recognizes veterinary technicians for their contributions in animal healthcare. Vet Techs are educated professionals who work closely with veterinarians to ensure the best quality of care for animals. We’d like to recognize Jolene Hanna, the Animal Health & Quarantine Manager and Veterinary Technician at Newport Aquarium. Thank you, Jolene for all that you do! Jolene Hanna, RVT Animal Health & Quarantine Manager at Newport Aquarium, feeds a shark behind the scenes. As fate would have it, she ended up working with a completely different species – sharks! She helped launch the world’s first Shark Ray Breeding program, and ended up working with sharks here at Newport Aquarium. After college, Hanna joined AmeriCorps and completed the Vet Tech program before coming to work at Newport Aquarium. What has been your most memorable moment during your career? Newport Aquarium’s Shark Bridge Celebrates One Year! Newport Aquarium celebrates the one-year milestone of the world’s first Shark Bridge on April 30th. The V-shaped rope bridge is 75-feet-long and is suspended over the open water of the 385,000 gallon Surrounded by Sharks exhibit. The world’s first Shark Bridge is 75-feet-long and is suspended over the open water of the 385,000 gallon Surrounded by Sharks exhibit. It took about 788 hours of labor to make, build and install the Shark Bridge. More than 4 miles (approximately 21,750 feet) of rope was used to construct the Shark Bridge. It’s made of 1.5 tons of steel, and is strong enough to hold the weight of up to 20,000 pounds, which is equal to an entire semi-truck, 25 Mighty Mikes (our 14 foot, 800 pound American Alligator) or more than 600 King Penguins! More than 4 miles of rope was used to construct the Shark Bridge. It’s made of 1.5 tons of steel, and is strong enough to hold up to 20,000 pounds. Surround by Sharks is home to six species of sharks including our Sand Tiger Sharks, Sand Bar Shark, Zebra Shark, Black Tip Reef Sharks, Nurse Shark, and Scalloped Hammerhead. It also houses our four exotic Shark Rays Sweet Pea, Scooter, Sunshine, and Spike. You never know what you’re going to see when crossing Shark Bridge. Denver, the mischievous loggerhead sea turtle, might come to the surface to take a breath just below your feet. You can even watch as our biologists target feed our Shark Rays! Shark Bridge is an interactive family walk through experience. Don’t fear! If Shark Bridge isn’t for you, you are welcome to walk along the edge of the tank and you can still view all of the amazing animals swimming inside. Crossing Shark Bridge is included with Newport Aquarium admission. Since opening last year, it has been estimated that guests have crossed Shark Bridge more than ONE MILLION times! Do YOU dare to cross? Shark Bridge is an interactive family walk through experience. Walkers will experience slight side-to-side motion and some uneven footing. All guests must use the entrance due to the one-way direction of travel. All guests must walk themselves. No guest may be carried. Shark Bridge is an able-bodied experience. For the safety of all guests running, jumping, rough play, climbing, food and drinks, hard or soft casts or braces of any kind are strictly prohibited on Shark Bridge. Closed-toe shoes are recommended and shoes must be worn at all times. Children younger than 5 years old must be accompanied by a parent, guardian, or chaperone. Newport Aquarium is not responsible for lost or dropped items. Guests are encouraged to secure all items before entering Shark Bridge. Items that fall may not be able to be retrieved. Sweet Pea swims past two of her newborn pups. 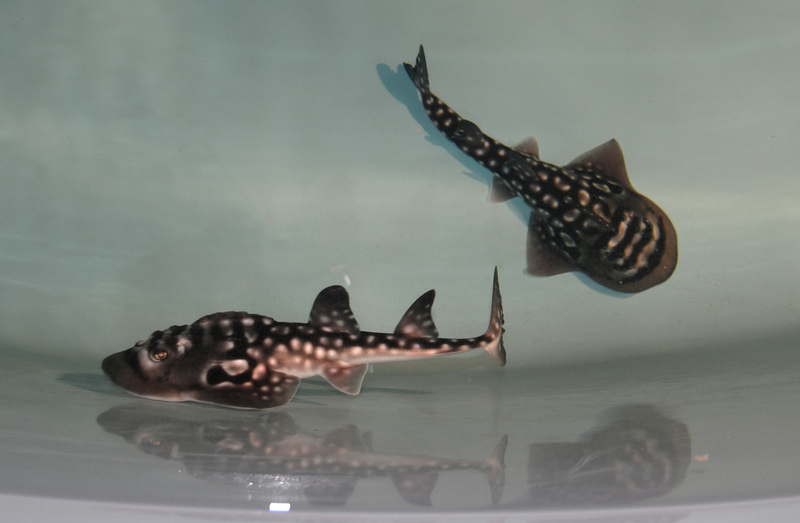 NEWPORT, Ky. – In a historic biological achievement, Newport Aquarium announced Wednesday that Sweet Pea, the first documented shark ray to breed in a controlled environment, gave birth to seven pups on Friday, Jan. 24, 2014. With Sweet Pea housed at an offsite facility in Northern Kentucky, the first pup arrived at 12:25 a.m. ET. A total of three females and three males survived the nearly five-hour birthing process, while a fourth female pup did not. Newport Aquarium now has 10 shark rays in all, which is the most in the world from any one institution. Three high definition surveillance cameras were installed at the offsite facility earlier in the week to monitor Sweet Pea’s progress. With this technology, Newport Aquarium officials had the ability to remotely watch Sweet Pea online. General Curator Mark Dvornak first noticed the pups at around 5:20 a.m. while checking the live video feed on his tablet from his home. He immediately sent an alert out to the rest of the husbandry staff and by 5:35 a.m. biologists were on site monitoring the six newborn pups. After each pup went through a medical examination, they were all moved into a separate tank adjacent to Sweet Pea’s tank. The pups’ weight ranged from 2.1 to 2.4 pounds, while their length ranged from as long as 1 foot, 7.3 inches to as short as 1 foot, 6.4 inches. A closeup of two newborn shark ray pups. 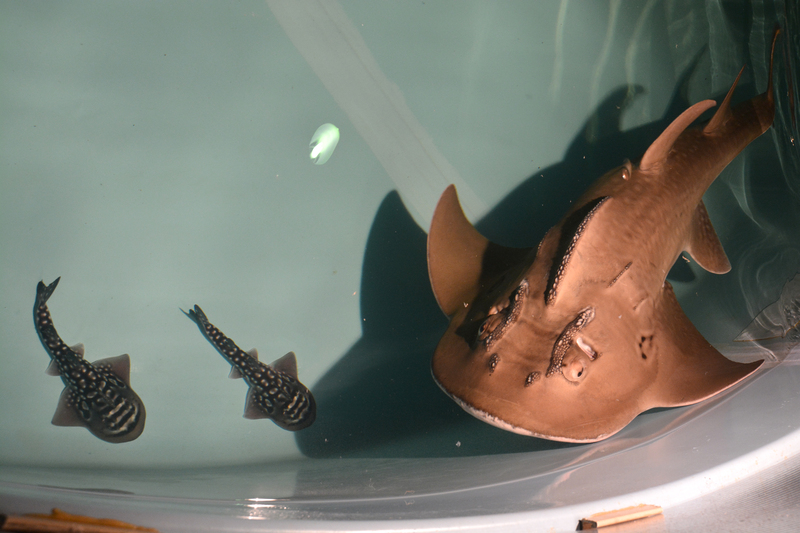 This historical achievement was made possible through Newport Aquarium’s revolutionary Shark Ray Breeding Program (SRBP), which was established in February 2007 with the introduction of what was, as the time, an extremely rare male shark ray named Scooter. The SRBP expanded with the introduction of a second female shark ray, Sunshine, in 2009 and a second male, Spike, in 2013. Sweet Pea and her new newborn pups will go on exhibit at Newport Aquarium on separate to-be-determined dates. Shark rays (Rhina ancylostoma), also known as Bowmouth guitarfish, are rare and distinctive fish from the Indo-Pacific region. Feeding mostly on crabs and shellfish, they live near the coast and offshore reefs in tropical waters. Very little is known about this species that receives its name because their wide head area resembles a ray, while the rest of their body resembles a shark. Sweet Pea’s successful birthing comes on the heels of reports that surfaced in January 2014 that the International Union for Conservation of Nature (IUCN) estimates that 25 percent of all shark and ray species are at risk of becoming extinct. Shark rays are officially on the IUCN Red List of Threatened Animals, meaning they are vulnerable to extinction. Threats to shark rays include habitat destruction, pollution, overfishing and the use of their fins for products including shark fin soup. Newport Aquarium husbandry’s most immediate obstacles are to get the pups to eat and to monitor their interaction amongst one another. The tank where the pups are located has been filled with live crab for the newborn shark rays to eat once they become hungry for the first time. “We’ll be providing them with a smorgasbord of live food items that they might encounter in the wild,” said Jen Hazeres, who along with fellow aquatic biologist Scott Brehob work closely with the SRBP. When Sweet Pea initially made history in June 2005 by becoming the first shark ray to go on display in the Western Hemisphere at Newport Aquarium, there were just five institutions in the world with shark rays. Today that number has increased to 25 institutions. For the most up-to-date information on Sweet Pea and her six newborn pups, visit www.NewportAquarium.com, like us on Facebook and follow us on Twitter. Newport Aquarium showcases thousands of animals from around the world in a million gallons of water. Newport Aquarium is a Herschend Family Entertainment company (http://www.hfecorp.com) and an accredited member of the Association of Zoos and Aquariums (AZA). Newport Aquarium is open to the public 365 days a year and is located two minutes from downtown Cincinnati at Newport on the Levee. Like us on Facebook (Facebook.com/NewportAquarium) and follow us on Twitter (@NewportAquarium).